Bruce Pearl’s job at Tennessee protcted by contract – ESPN. 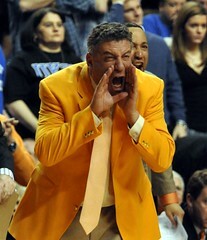 via Bruce Pearl’s job at Tennessee protcted by contract – ESPN. The Tourney, or Why I think things should change. Many in America, my wife included, never experienced the Madness outside the small view of a local Cinderella Team as it made a run for the final four. For her it has always been the basketball bubble of WVU in the Big East. However for me growing up in the heart of SEC and ACC basketball, March and early April is a massive pulsating creation of athletic amazement and heartbreaking sadness. I remember watching packed Conference Championship weekends in early March with Back-to-Back-to Back Conference title games in two days. All to be capped off by the Selection Sunday TV Special. For the next two weeks my father and I would come home after school and gaze at 3hrs of early games on tape during the nightly news break in games. Then another three to four hours of basketball and amazing moments. For most of my life, the Tournament has been the same with only one mild alteration, the 16/17 play-in game on ESPN. Now that special formula is on the verge of commercial collapse under the weight of proposed expansion. As it stands now, the NCAA is looking to expand the field to 96 teams. This would give the top eight selections in all four regions the right to a single game bye. For some this may seem wrong and at first i agreed but after the first weekend of play I have some suggestions as to a good option. Instead of giving byes to the top eight give them to Conference champions. This legitimatizes the wins that currently are diminished under the current system. In addition, expand the Pod system to include the new play-in round so that people will have the opportunity of seeing three games and reduce travel by teams. The more I ponder the possible expansion it seems a good idea. In addition, a broadcast sharing agreement could be worked out with ESPN covering this new first round and flex schedule with ABC local interest games.